In Sewall’s Point, today is the first morning in three weeks that it hasn’t been raining, or just about to. My porches have been slick with moisture and leaves. The frogs in my pond are so loud at night I have to put in ear-plugs. My husband and I laugh saying you can count sheep, but there is no sleep! In spite of the history, or knowing why they do it, it just seems so wrong that little St Lucie has to take basically one-third of the crap water for the state. Sorry and I know my mother will not like that word, but its the truth. Thank God for Joe Negron and his work last year as President of the Florida Senate and resurrecting the EAA Reservoir. And curse to any new Governor who does not help it be fulfilled. 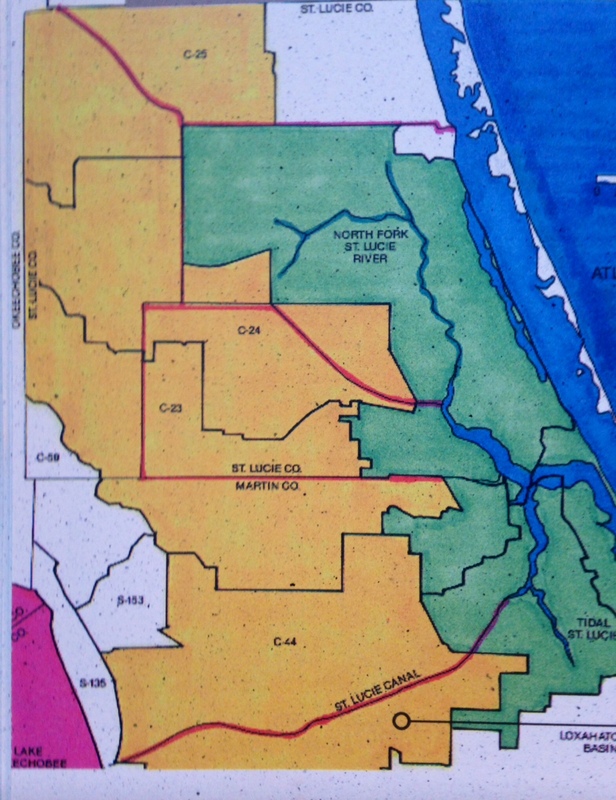 The natural drainage basin of the St Lucie River shown in GREEN below was much smaller than it is today. The introduction of four man-made drainage canals dramatically altered its size and the drainage patterns. 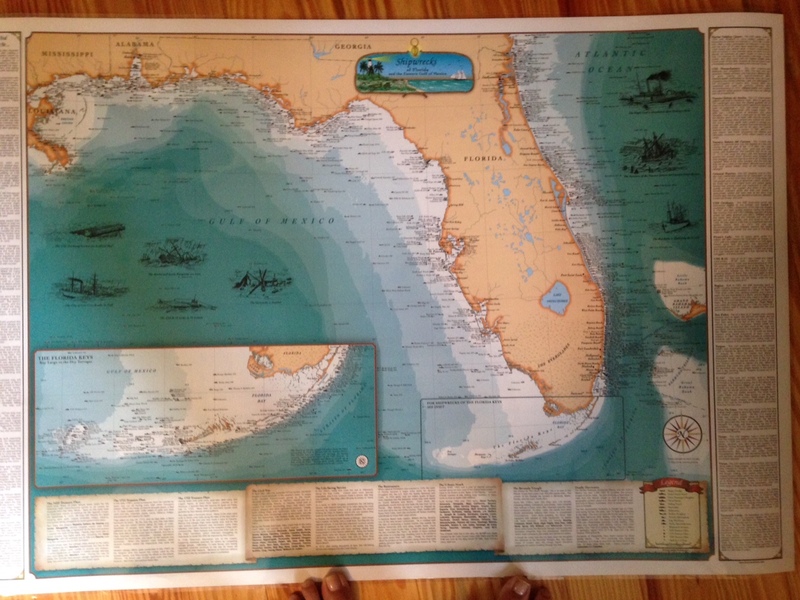 This primarily being C-44, the canal connected to Lake Okeechobee (bottom). 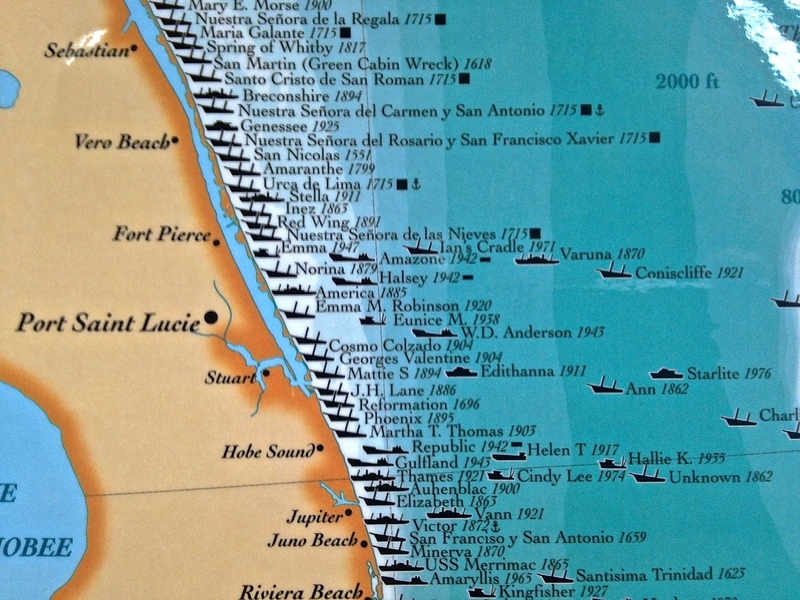 One can see from the map image that C-44 Basin and of course Lake O’s water, the most effective assassins, were never part of the St Lucie Basin as were not Port St Lucie’s C-23, C-24, and C-25 system. These canals have killed our river! 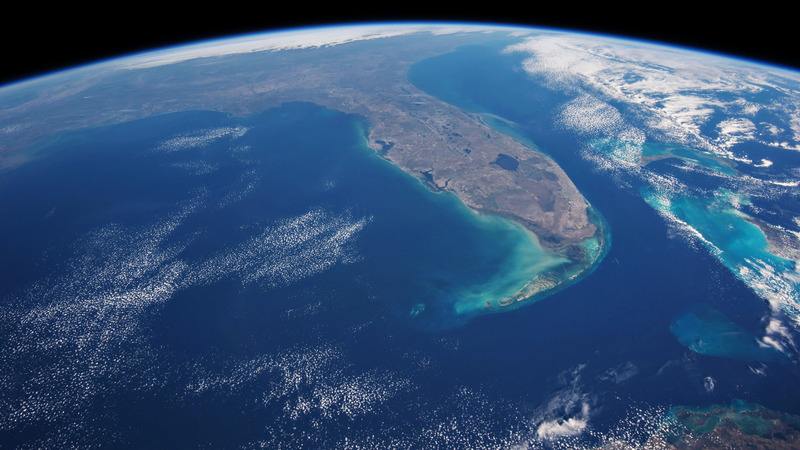 The EAA Reservoir must be built, and in time, more water must move south to Florida Bay. We shall be fixed or compensated or a combination of both for our now noxious-reality. We will not accept this fate. Who knows what this summer shall bring. But one thing is for sure, this life along the St Lucie, is now toxic. Thank you to ACOE for the following information and press conference yesterday. 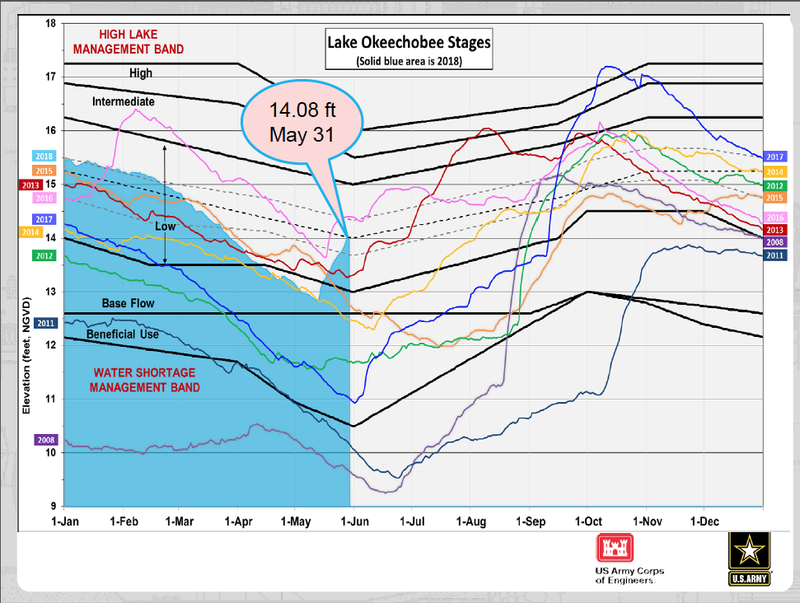 Lake O water management slide_20180531: this slide shows lake levels comparatively. The lake is now high going into hurricane season, starting June 1st, ironically today. The lake is managed as a reservoir for agriculture. The U.S. Army Corps of Engineers (USACE) Jacksonville District will start releasing water from Lake Okeechobee this weekend as part of its effort to manage rising water levels. The discharges are scheduled to begin Friday (June 1). 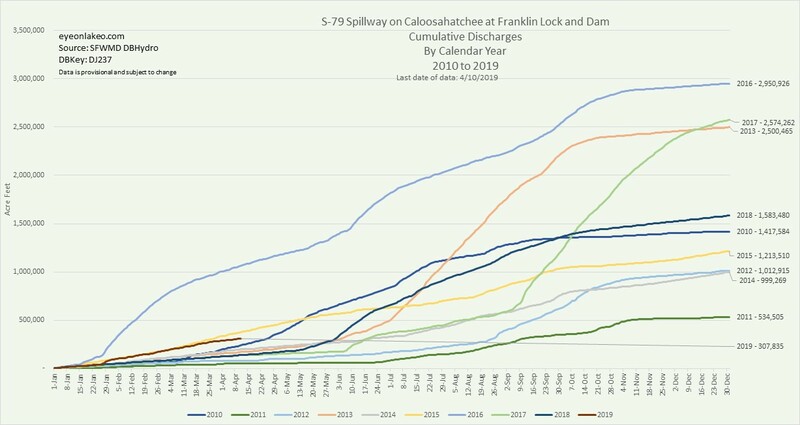 The target flow for the Caloosahatchee Estuary is 4,000 cubic feet per second (cfs) as measured at Moore Haven Lock (S-77) located in the southwest part of the lake. The target flow for the St. Lucie Estuary is 1,800 cfs as measured at St. Lucie Lock (S-80) near Stuart. Additional runoff from rain in the St. Lucie basins could occasionally result in flows that exceeds the target. Today, the lake stage is 14.08 feet, up 1.25 feet from its 2018 low which occurred May 13. The lake is currently in the Operational Low Sub-Band as defined by the 2008 Lake Okeechobee Regulation Schedule (LORS), but within one foot of the Intermediate Sub-Band. 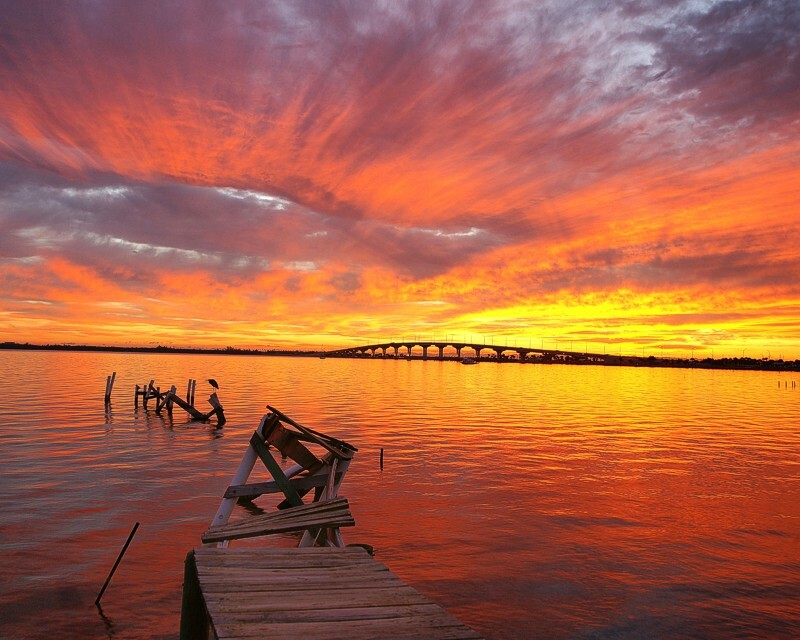 Under current conditions, LORS authorizes USACE to discharge up to 4,000 cfs to the Caloosahatchee (measured at S-77) and up to 1,800 cfs to the St. Lucie (measured at S-80). For more information on water level and flows data for Lake Okeechobee, visit the Jacksonville District water management website at http://www.saj.usace.army.mil/Missions/CivilWorks/WaterManagement.aspx. If you spend billions to redirect the water—then what? I assure you your lagoon will still be dead as hell untill you bring back the coquina formations that Henry Flagler and others removed. Aluminium sulfate is acidic. When I was at your town hall I asked the guy giving his presintaion on bio-solids do they use aluminium sulfate in the sewage treatment plants—he said yes they do. Aluminium sulfate causes alzhimers because it totally desolves in water and can be absorbed into the blood stream. I think the very first thing they need to do is neutrilize the acid in the sewage they put on farmers land useing calcium carbonate(beach sand). This will also let the organic material( crap) break down before it makes it to the lagoon. Unbeliveable change for the better here—- I have a little wire basket and filtered out many small scoops of sand. Everywhere I did this I found at least 50 little baby coq1uina clams. Sea grass growing everywhere faster than the cretures can eat it. Clams feed millions of blue crabs. Yesterday wadeing the flats I came across 20 foot black circles in sand then I saw a school of about 50 black drum feeding on baby coquina clams. They were makeing the circcles. I can not find a place in the lagoon where there is no coquina clams. I have had a theory. Muck with zero desolved oxygen lays on shell. Because there is no desolved oxygen there is almost no reaction from the acid in the muck and calcium base. Creating foam on the shore releases lots of desolved oxygen so reaction can happen in deep water makeing it posable for sea grass to grow. Take a look at the water in the swales and driveways in North River Shores. GREEN ALGEA! This can be found in the area where there are no septic systems, sewer system is in place. I believe it! Please photograph and share. jthurlow@me.com The problems are many and like a wheel with many spokes leading to a middle we must work on everything that leads to that middle. Thanks so much Teri. At our lagoon house they seemed disapointed that there was no fish kill in the Banana River like they predicted. I think the CRC was the last best chance for peacefull change of rotton state government but with Govener Scott and senate president Joe Negron decideing who is on it the citizens of Florida will NOT be represented. Takeing US citizens right to vote away tops my list of complaints of the CRC. Our state government see them as criminals but I say our state gov. and special interest groups have commited economic treason against our citizens and created an environment for crime to flourish.I can give many examples.